Linda Joy Myers’ memoir, Don’t Call Me Mother, is a rich read for many reasons, and one you won’t want to miss. Aside from the gripping storyline and heart-warming ending, her brilliant description makes the story blazingly real and compelling. Her technique is worth studying. They all stand around as if there’s an elephant in the garden everyone’s determined to ignore. Bernie stands back, her dark eyes flicking back and forth. Afterwards, Mother and Gram talk-fight all afternoon, chain smoking until the room fills with gray. Edith drops a bowl on the floor; Blanche pokes her finger with her embroidery needle. The men try to take refuge in outdoor work, but Mother follows them for a flirtatious tour of the mink pens, a scarf over her nose. She includes intangible elements — what she senses or reads between the lines, and what she is feeling. On the last day at Grandpa’s, I feel shaky inside, already missing them. I have a lump in my throat as Bernie helps me pack the tiny doll clothes she made for me. It’s clear she doesn’t want to know too much, and I’m sure the truth would worry her. I sense that she’s genuinely grateful that Gram is taking care of me because she simply wouldn’t know how. Most of us find it challenging to get back into moments that happened maybe fifty years ago fully enough to capture details so vividly, so I’ve asked Linda Joy to share tips she has found effective. Research the sensual details—weather, location, setting, temperature, sound, sight—of your memoir. I went back to Oklahoma during the early summer to see if what I remembered about the wheat—the color, the landscape, the smell—was the same. It was! Genealogical research helped me to get the names and dates straight in my memoir—and I did it before ancestry.com came onto the scene. Good old fashioned research from primary sources like courthouse records can reveal surprising details. Write, rewrite, and rewrite some more. As I wrote my book, I had to surrender to the writing and rewriting process, and came to love the fact that a revision meant I could "see again" what I'd written before, and make the world I was creating on the page more real and well-rounded. Once you get the "facts" clear that you want to share with your reader—otherwise known as your "truths," you look for poetic and metaphorical language, a fresh way to see what you already know, and bring it to the page. Don't be shy about this. Close your eyes and use your imagination, tune into your right brain, and write. If you have dramatic moments you remember from childhood—in my case it was the feeling and sound of the powerful trains that brought and took away my parents—research these details as well so you can feel them again in your body. I would stand near train tracks, while preparing to take the train!—and absorb the feeling of the train's arrival, feeling much as I did as a child, exhilarated, vibrating, bowled over by its power. That helped me to write about trains with a refreshed sense of experience. Think of yourself as a painter, and the writing, especially description, as the paints and colors on your canvas. Visualize each scene in full color, choose your words as if they are colors. If you are writing from a child's point of view, close your eyes and remember as much as you can from being a smaller, more vulnerable person. Look at photos of when you were small. Notice how delicate and small children are, even at age 8 or 9. Write from photographs—evoke all the emotion you can to drive you through the powerful scenes in your memoir. Remembering, imagining, and dreaming are close cousins. Fall in love with your Thesaurus. I went over every paragraph with it in hand, and looked up lots of words to find the best fit that was evocative. Be willing to feel tired, discouraged, and then buoyed up by the writing process. 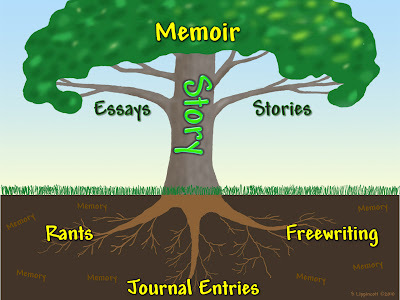 You need to have the long view about writing a memoir. Some days it's fun, and other days you just feel the weight of it all, but in the end, it's all worth it! Thank you, Linda Joy. Your story is so compelling I know nobody will want to stop to analyze as they read, but writers can use your list as a short course in description writing as they scan back over the story a second time. Linda Joy Myers, PhD, is Founder and President of the National Association of Memoir Writers and author of The Power of Memoir and other books. Visit the NAMW website and read her blog, Memories and Memoirs. Write now: write a short story and incorporate at least four of Linda Joy’s tips as you write the description in it. Use these tips to revise an older story. Great title. Great writer. Great interview, ladies. I love these points! I'm so glad I'm not the only writer who uses a thesaurus when editing. My thesaurus is packed away at the moment, and while editing today I felt like I was missing an arm. Used well they are a wonderful tool for finding the perfect word. Jessica, glad you find them helpful. Don't forget that Word has a thesaurus built in, and I keep a link to Thesaurus.com on my bookmark bar for instant access. Thanks Karen. I know you will enjoy reading the book. Thank you Sharon for such a heart warming introduction to some of the techniques I used in writing my memoir. Most of us have to learn how to write while writing our first book, and that was true for me. I took many classes, and kept re-writing until I finally had to trust my book to an editor, and let it go into the world! I love Sharon's book on description! Join us at www.namw.org May 17 for Sharon's teleseminar on Writing Compelling Description! You'll be glad you did.